Digital cameras revolutionised photography, but it was the smartphone putting a camera in everybody’s pocket that really changed the world. Now so much is recorded, uploaded and shared on the internet and we’ll snap anything, not just a few shots of the kid’s birthday party. As the cameras in our phones have gotten better, so the market for dedicated digital cameras has shrunk. But, if you have a look online, there are some serious bargains out there and cameras well under £100 can still outperform those on £600 smartphones incorporating features like 30x optical zoom and image stabilisation, which can come in very very handy. As I mentioned, we love to share our photos, so WIFI is now a feature of many a dedicated camera, allowing you to wirelessly transfer photos from the camera to your phone without needing a computer or network router sitting in the middle. I must admit, whilst researching upgrades to my camera kit, I've found these WIFI solutions to be pretty clunky and I'm not sure I’d end up using it very often. What I really miss on the phone is the optical image stabilisation that my pocket camera has for low light shots. My Samsung Note 3 is a fab phone with a solid camera - but my unsteady hands ruin any chances of focus indoors or on a cloudy day. It seems a shame to spend a fortune on a new camera, or replace an otherwise great phone for this occasional need, so what to do? Happily the world of adaptors on Amazon was here to help. 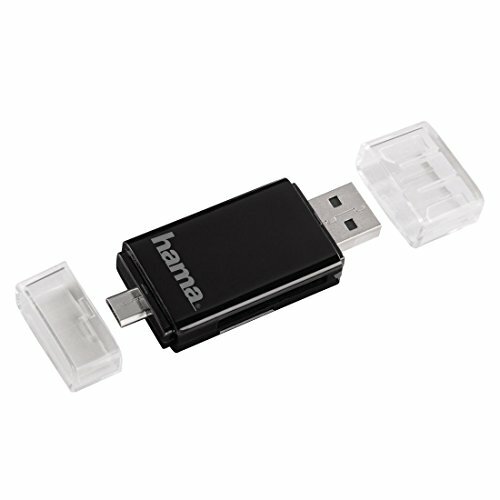 This is a USB-On-The-Go adaptor from Hama that includes a reader for full-sized SD and micro-SD cards. If you have an Android phone and it supports ‘usb-on-the-go’ (ask in the comments if you’re not sure or email me) then I think you might like this. The plastic adaptor weighing only a few grams includes a full sized USB connector on one end and a micro-USB on the other, allowing connection to your computer . . . or your phone. Pop the SD card out of your camera and it will fit straight into the slot on the side. A second slot allows reading micro-SD cards, which are a typical expansion format for phones. On connecting to your phone, you’ll want a file manager app to navigate the files on your card and now you can pick your favourite shot out for sharing on Instagram, Facebook or whatever you want! It’s a great way to get the best quality possible without having to spend a fortune replacing devices and given that sites like Flickr and Facebook will post the pictures at full resolution, it will really help you stand out from the crowd! Apart from the obvious compromise of having to physically connect the SD card up, which only takes a few moments if you’re somewhere comfortable, there is one more thing you need to be aware of. Like a computer, your phone doesn't like cards being randomly pulled out - it likes to be told and the language it tends to use comes from Android’s Linux origins. The connection should be ‘unmounted’. This is usually done by going to the phone’s settings, then ‘Storage’ and unmounting the USB connection from there, which will take a few seconds. Failing to do this results in a small risk to the card itself and a bigger risk to any file the phone happens to be holding open at the time. You have been warned! Other than that, the the Hama adaptor represents a cheap and easy way to share pictures from your camera with your phone.